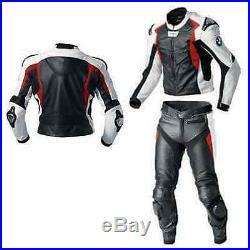 BMW Racing Motorbike Suit -! 1.3mm Top Grain Cowhide Leather. External CE Hard Shoulders. Padded Back and Elbow. Original YKK Zipper at Front and Cuffs. Inner Fixed Mesh Lining. Curved Sleeves for proper riding position. All Sizes Available (See Size Chart in Pictures). All sizes are available. See size chart which is available in Pictures….